Tigers starter (and finisher) Rick Porcello pitched arguably the best game of his career last night, as he blanked the Rangers 6-0 at hitter friendly Ballpark in Arlington. He allowed just three hits and three walks while striking out six in a 115-pitch effort to register his first career shutout. The still just 25-year-old right hander lowered his season ERA to 3.41 with his masterful performance. That is a full run lower than his career mark of 4.41. As shown in Figure 1 below, one of the main reasons for Porcello's improvement is he is finally getting left-handed batters out on a regular basis. While Porcello has generally had reasonable success against right-handed batters, left-handers batters have pounded him for an OPS of .750 or better in every year of his career including .884 in 2012 and .808 in 2013. This year, his OPS against is down to .692. 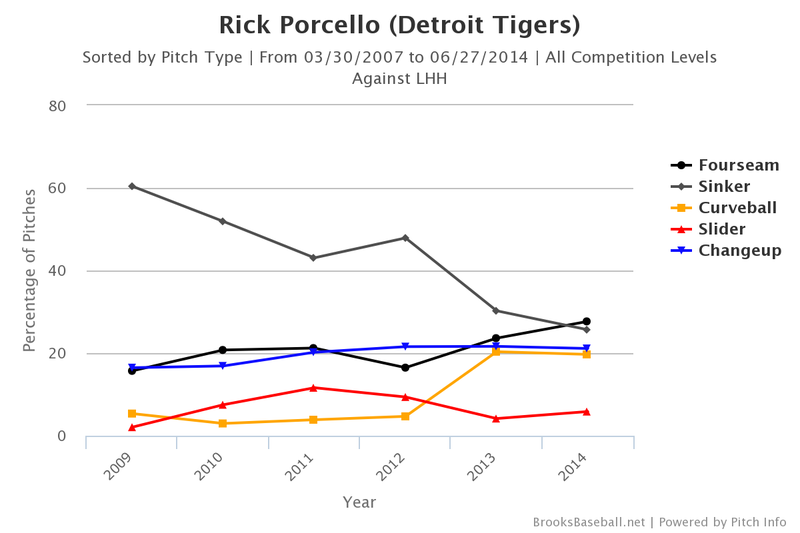 Figure 2 below from BrooksBaseball.net illustrates that Porcello has changed his pitch selection versus lefties batters drastically since his rookie year in 2009. In his early years, he was primarily a sinker ball pitcher versus all types of hitters including 60% of his pitches to left-handed batters in 2009. This year, he is down to just 26% sinkers. Porcello now throws more four-seam fastballs (28%) than sinkers to left-handed batters. His curveball has gone from being almost nonexistent his first four years to around 20% in 2013-2014. He also uses a changeup 21% of the time. 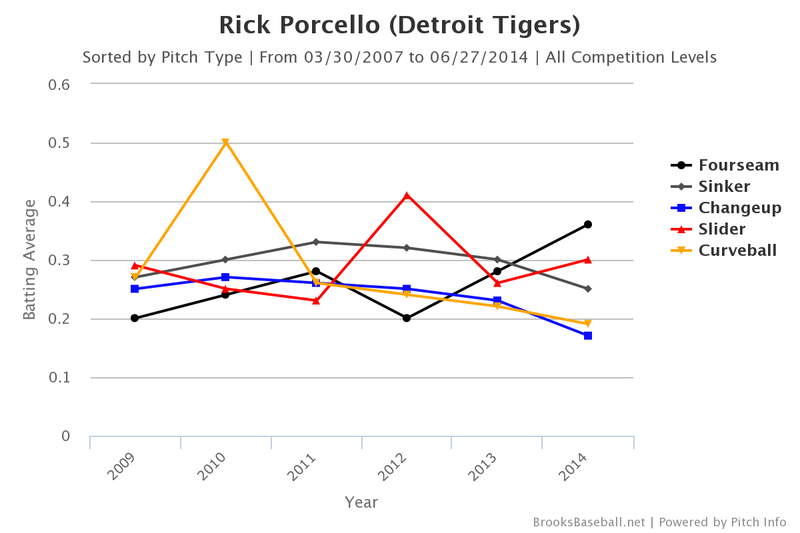 The results of Porcello's pitch selection versus lefties are shown in Figure 3 below. He has been most successful with his changeup (.170 Batting Average Against) and curve (.205). He has allowed a .328 batting average on his sinker which is probably why he's throwing it less often. The sample size of a half season versus left-handers is, of course small, but he is showing no signs of his previous difficulty versus opposite-handed batters so far this season. If Porcello can keep it up, he goes from being a good fifth starter to a solid number three and a pitcher who can probably be trusted in a playoff series in October. What also doesn't show up in the charts from that last game is how cool and calm and casual he looked after that strikeout to get out of the early jam. Watching him walk off the mound so nonchalantly all I could think of was I'm glad that guy is on our team!